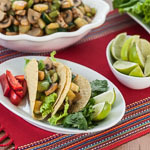 My family’s love of Mexican food is well-documented on this blog, and we have some kind of Mexican dish on the menu once a week. My boys especially enjoy the leftovers for lunch. When I pack their lunch bags for school, I warm up any leftover rice, meat, and beans, then layer it into their Thermoses and top it off with cheese and salsa. It’s a healthy hot lunch that they love and devour. 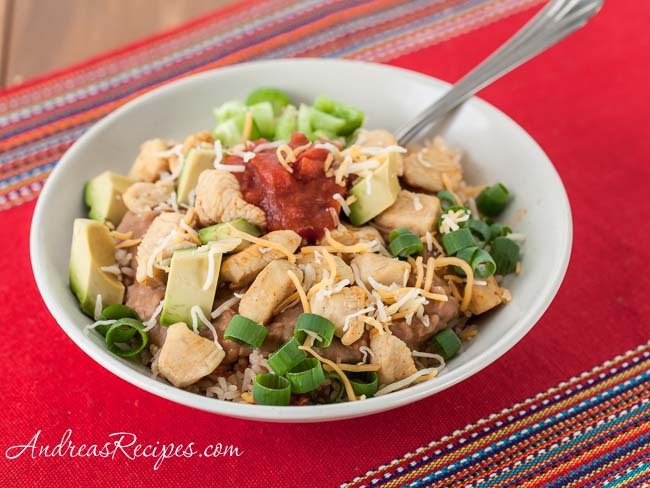 Inspired by that love of Mexican rice bowls, I created this recipe for the newly updated Old El Paso website, which is loaded with healthy and flavorful recipes, and most are easy enough for a weeknight meal. Make sure you check it out! If you have a rice cooker, you can easily make the rice in your machine, just follow your manufacturer’s directions and substitute about 1/3 of the water with salsa. 1. Bring the Old El Paso Medium Thick n Chunky Salsa and water to boil in a medium pot with a lid. Stir in the rice and bring back to a boil. Reduce heat to low and simmer for 20 minutes. Remove from heat and allow to rest, covered, for 10 minutes. 2. 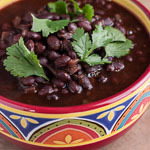 Heat the Old El Paso Fat Free Refried Beans in a small pot with a lid. 3. Meanwhile, in a large skillet, warm the sunflower oil over medium heat. Sauté the chicken pieces in the oil until the chicken is cooked through, about 7 to 8 minutes. Add the Old El Paso Mild Taco Seasoning Mix and ½ cup of water. Cover and allow to cook for 2 to 3 more minutes. 4. Scoop the rice into bowls, and top each with the refried beans and chicken, and add the vegetables, salsa, and cheese as desired. 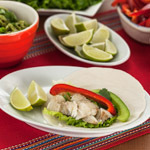 Found your blog through Kayln’s and am delighted with your recipes. Will be visiting regularly from now on. Thanks Phyllis! I hope you find some food here that you really like. Kalyn is a good friend and I always enjoy visitors from her blog.